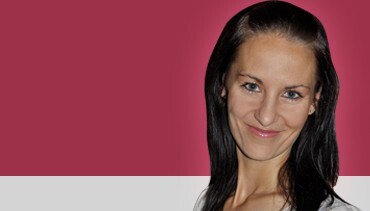 The North West Province is one of South Africa's smallest provinces, bordering Botswana to the north and surrounded by Gauteng, Limpopo, Free State and Northern Cape. The province was created in 1994 by the merger of Bophuthatswana, one of the apartheid-era "homelands", and the western part of the Transvaal province. Most of the region is made up of scattered trees and grassland, providing the ideal habitat for a Big 5 safari, which can be had at Madikwe Game Reserve and Pilanesberg National Park. Fondly known as the 'heritage province', the North West boasts several cultural villages, where visitors learn about and experience traditional culture. There are 2 World Heritage Sites in the province - the Vredefort Dome and the Taung hominid fossil site, part of the Cradle of Humankind. There is much to do, from rock climbing, fishing, hiking to canopy tours; the North West Province is a fantastic safari adventure holiday destination. The 2 Big 5 game reserves in the North West are malaria-free and within easy reach of Johannesburg and Pretoria, making it an easily accessible and rewarding family holiday location. Madikwe Game Reserve offers luxury safari accommodation, morning and evening game drives, delicious meals, exquisite views, and exclusive experiences with Africa's Big 5. Experience the delights of Africa’s gaming capital, Sun City. This is a thrilling urban resort bordering the Pilanesberg National Park, which is convenient for visitors wanting to experience both the tranquillity of nature and the entertainment of the casino. Big game safaris at Pilanesberg National Park; watersport activities at Hartbeespoort Dam; cultural flavour and traditional flair at numerous villages. 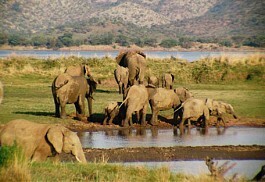 Among Southern Africa’s fascinating game reserves, Pilanesberg National Park is possibly the most accessible. Situated in the transition zone between the Kalahari and the Lowveld, this vast area offers thrilling big game viewing in a malaria-free environment. 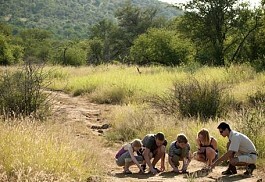 For an exclusive and family-friendly game viewing experience in North West, visit Madikwe Game Reserve. It is a malaria-free, Big 5 reserve with a fantastic diversity of fauna and flora. It is home to the Big 5, plus black rhino hippo, brown and spotted hyena, giraffe, wild dog, and cheetah, as well as a wide variety of birds. Activities at the lodges vary, but most include game drives and nature drives accompanied by experienced and informative rangers who are able to interpret the many encounters of a safari. Early morning and evening adventures allow guests to truly experience the African bushveld at its best. Other activities may include archaeological safaris, walking safaris, golfing excursions, and ranger skills training for the ambitious guest. In Sun City, urban excitement awaits; at Hartbeespoort Dam, enjoy thrilling watersport activities; and the Magaliesberg mountain range and tree-top canopy tours are not to be missed. The North West Province has pleasant weather with year-round sunshine. Hot summers bring brief afternoon showers that relieve the hot earth between the months of September and April. November through to February brings the highest expected rainfall. Daytime temperatures are hot and the air is humid with an average of 31 degrees Celcius. Sunscreen is a necessity and one would appreciate a hat when out and about in the sunshine. Winter lasts from May to September and is dry and cold with evening temperatures as low as 2 degrees Celcius, and reaching a comfortable 22 degrees Celcius during the day. Depending on one's tolerance of the heat, the North West is a great destination throughout the year. The crown jewel of the North West Province is the Madikwe Game Reserve. This malaria-free reserve is home to the Big 5, as well as a variety of other game, from large herbivores, to less frequently seen nocturnal critters. Madikwe is also the safe haven for 2 of Africa's endangered predators, the African wild dog and the cheetah. In Madikwe, Thakadu River Camp and Buffalo Ridge Safari Lodge are superb and affordable options. For a small group or family travelling together, look no further than the beautiful Morukuru Safari Lodge. Pilanesberg National Park is the booming result of Operation Genesis - a wildlife relocation project aimed at protecting endangered species that took place in 1979. It is now home to over 7000 species and has the unique landscape loaned to it by the dormant volcano crater. For some urban fun, visit Sun City, which is home to the world's fastest zipline. At 280m high and 2km long, this slide of a lifetime takes you soaring at high speeds (150km/h) over the unusual landscape of Pilanesberg. Sun Safaris can arrange scheduled flights for guests who wish to fly into Sun City Airport. Alternatively, one can self-drive from anywhere in South Africa, as the roads are tarred and in good condition. One's drive time will depend on the route; however, usually a trip from Johannesburg to Madikwe Game Reserve will take approximately 4 hours in a regular, sedan car; however there are a number of interesting places to stop, so we recommend giving yourself time to explore. Sun Safaris also arranges private road transfers for guests not wanting to drive themselves. Guests flying directly to Madikwe Game Reserve will be picked up at the airstrip and driven to their lodge/camp destination.